Nathainail “Nathan” Bashir is more at home in the field than in the classroom. The graduate student, who is earning a master’s degree in both geology and geophysics and geological engineering, constantly travels around the state studying bedrock variations and perfecting ways to find their depth. Bashir uses two main mapping techniques to find bedrock’s depth: multichannel analysis of surface waves and electrical resistivity tomography. After performing these tests, he combines the results. This process helps Bashir cut through the “clutter” of false readings that can be caused by caves and sinkholes, and identifies the differing levels of bedrock depth. The geology of the area he studies is quite different from that of his hometown. A native of Nonar, Pakistan, Bashir studied at the Quaid-i-Azam University in Islamabad, Pakistan, prior to moving to the United States. Last summer, Bashir was on co-op at Engineering Consulting Services (ECS) in Virginia. His work dealt mainly with structural geology and included analyzing a construction site for a new National Science Foundation facility. Besides his research, Bashir serves on the International Student Council at Missouri S&T, sings in the choir at the Campus Christian Ministry and is a part-time clothing model. 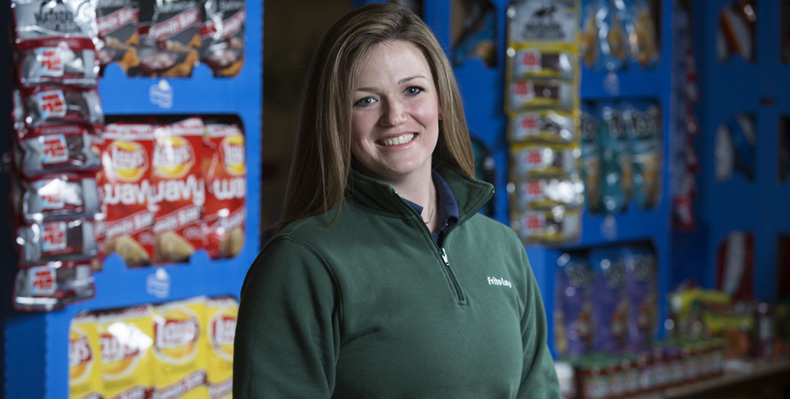 Frito-Lay’s Topeka, Kansas, plant operates 24 hours a day, so while most of us are sleeping, Catherine Swift is monitoring 10 production lines and 59 automated packaging tubes that take raw ingredients and turn them into bagged snack foods, ready for supermarket shelves. 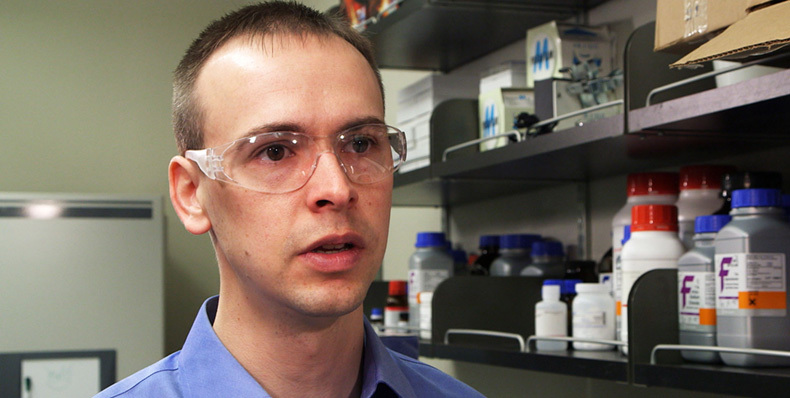 “As a core plant, we produce major products like Doritos, Lays, Sunchips, Tostitos and Fritos,” says Swift, who earned a bachelor of science degree in mechanical engineering at Missouri S&T in 2010. Each year the Topeka plant produces over 175 million pounds of snacks. Swift, who has been with Frito-Lay for almost five years, started out as an undergraduate intern. Now she is a manager on the plant’s third shift. Swift helps closely monitor the plant’s production process for moisture and oil levels, and each shift compares its batches to a reference product for appearance, flavor and texture. Swift ensures that the snacks that leave the Topeka plant are the same quality as the ones made in other locations. When Swift isn’t working, she coaches a local high school girls’ soccer team, making use of skills she honed as a Lady Miner goalkeeper for four years at Missouri S&T. She also frequently makes trips back to Rolla. Amiel Weerasinghe, who earned a bachelor of science degree in civil engineering in 2010 and an MBA in 2012. 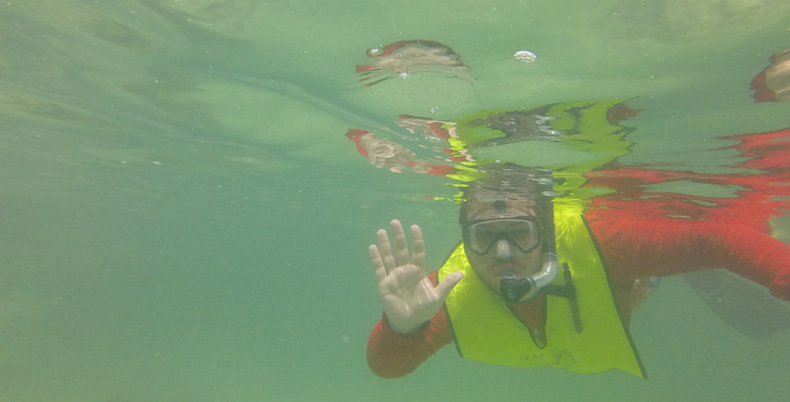 Justin Levy, who recently graduated with his bachelor’s degree in geology, waves to the camera while snorkeling off the coast of San Salvador Island in the Bahamas while on a nine-day field study trip. Justin Levy completed his collegiate career at Missouri S&T doing what he enjoys most – traveling. 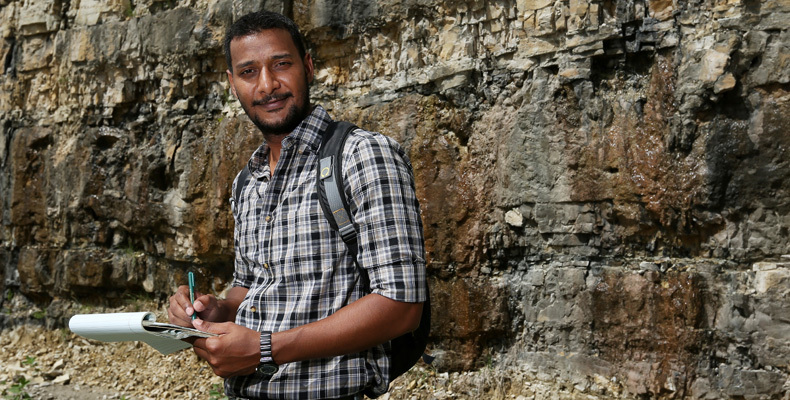 Levy was one of eight geology and geophysics students to join Dr. David Wronkiewicz, associate professor of geology and geophysics, on a nine-day field study trip to San Salvador Island in the Bahamas in May. The group left just days after Levy crossed the stage at commencement with his bachelor’s degree in geology. Although the students did group research on the geological formations and processes occurring on the island and their interdependency on biologic processes, each student also had the opportunity to do individual research. The group spends some time studying the Cockburn Town fossilized reef. With a passion for paleontology, Levy focused his research on the types of fossils found on the island. He studied a section of the island called the Cockburn Town fossil reef, which is made up of fossilized coral and shell fragments. He also tried to find fossilized decapods such as crabs, shrimps and lobsters. Unfortunately, Levy didn’t find any decapod fossils, but he still learned a great deal about the nature of field studies. 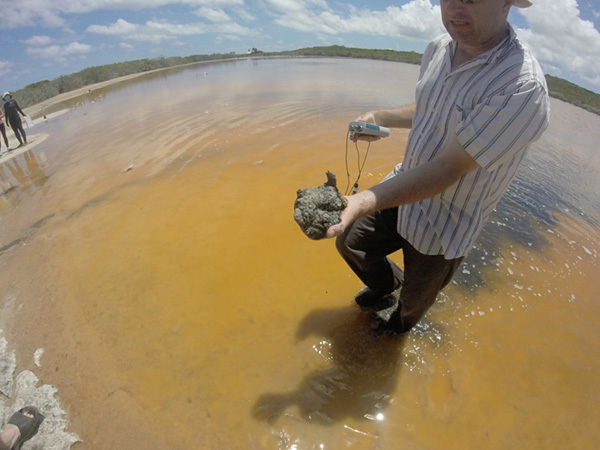 Dr. David Wronkiewicz, associate professor of geology and geophysics, holds some organic material pulled from the hypersaline water of Storr’s Lake while researching the shallow lake on San Salvador Island. In addition to studying the fossilized reefs of Cockburn Town, the students studied modern reefs, hypersaline lakes and cave systems. Much of their research was conducted in the water, either snorkeling on offshore coral reefs or wading in the shallow water of inland Storr’s Lake. They even did several snorkeling dives at night, encountering sea turtles and a shark. 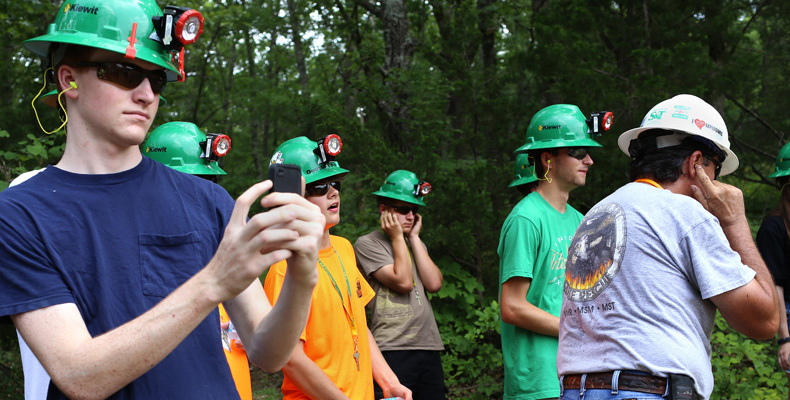 Levy and other students on the trip wrote about their experiences on S&T’s Miners Abroad Blog. Levy wrote about the striking lack of fresh water on the island. A Club Med resort was built on the island in 1994, he wrote, which increased the island’s freshwater pump rate by some 400 percent. By the early 2000s, the island’s fresh water had dried up. Nowadays, locals use rain collection systems to collect freshwater, then purify it. 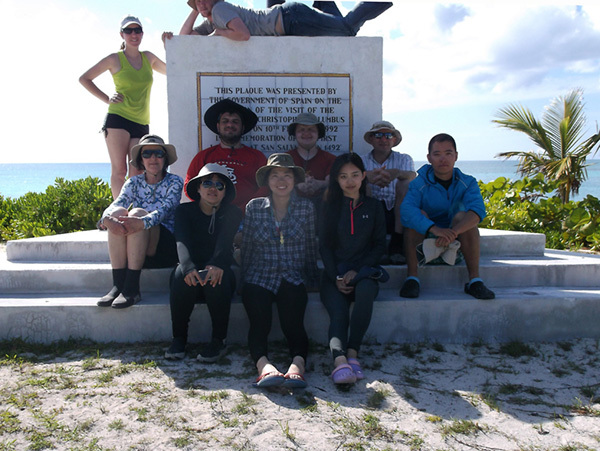 The group poses for a picture on San Salvador Island. 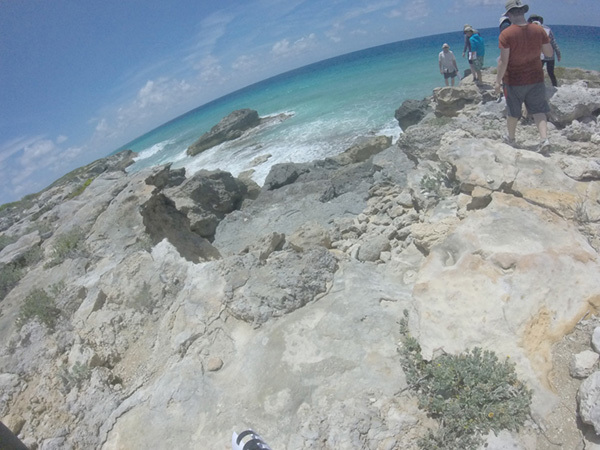 The group explored a “blue hole” that used to pump fresh water from beneath the island, but now it pumps salt water. Blue holes are inland caves or underwater sinkholes sometimes called vertical caves. These types of studies using blue holes as well as sea-level proxies can tell researchers about the past environment and help to predict the future, according to Levy. Levy says he’s thankful for his time at S&T, and the many opportunities he had to travel as a geology student, which included three weeks of field camp in Kansas, Oklahoma, Texas and New Mexico; three weeks of advanced field camp in Utah and Arizona; a summer trip to Bolivia with Engineers Without Borders; and a semester as an exchange student in Hong Kong. 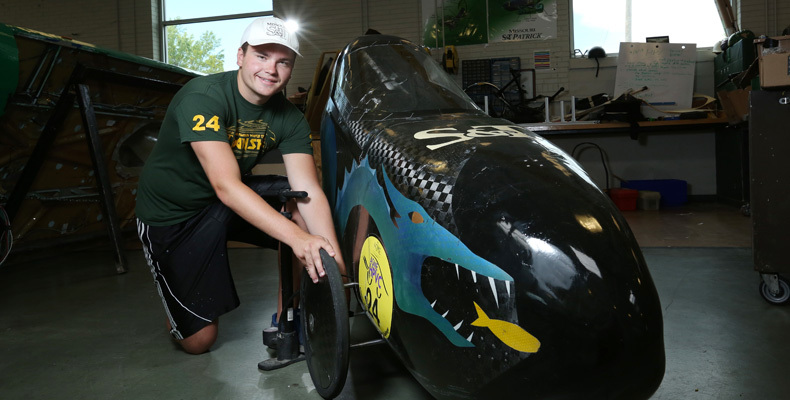 “This school has allowed me to find my passion, and that is travel,” he says. 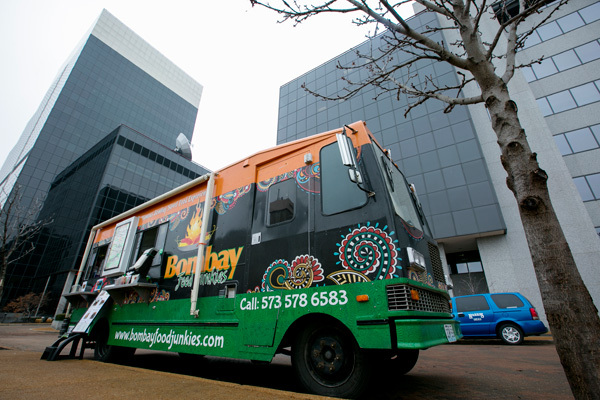 Sid Panchal works the window and serves authentic Indian street food out of his St. Louis-area food truck, Bombay Food Junkies. Inspired by a reality television show and missing the foods from his homeland, Siddharth “Sid” Panchal, who earned a master’s degree in computer science from Missouri S&T in 2003, opened Bombay Food Junkies in 2013. The Mumbai, India, native and his wife, Krupa, serve vegan and vegetarian meals from their food truck at St. Louis-area hospitals, industrial parks and college campuses, dishing out authentic Indian street food. The business idea started when the couple watched “The Great Food Truck Race” on the Food Network. That was enough to spark the idea of delivering authentic street food to the people of St. Louis. 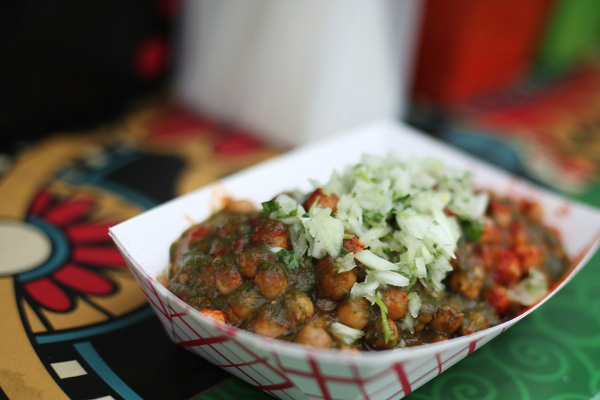 The samosa chole – pictured here – is the biggest seller at Bombay Food Junkies. 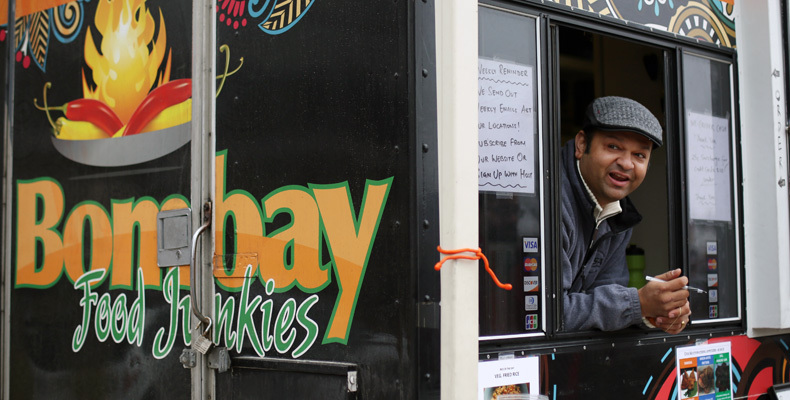 Panchal started scouring Craigslist for vehicles that could be converted into food trucks and called local food truck operators for tips and hints. After finding a truck, the couple launched a Kickstarter campaign and raised the necessary funds to get the truck wrapped in banners and fully modified. Less than two years after opening, Bombay Food Junkies took second place in a Best Vegetarian Food Truck competition sponsored by mobile-cuisine.com. The Panchals park their Bombay Food Junkies food truck for lunch, dinner and special occasions at locations throughout the St. Louis metropolitan area, including the corporate headquarters of Wells Fargo Advisors. Krupa runs the day-to-day operations of the truck, while Sid, a senior consultant for project management at Daugherty Business Solutions in St. Louis, helps out at the truck some weeknights and on weekends. Adapted from the Spring 2015 issue of Missouri S&T Magazine. Everyone has a passion for something. For Kailea Tilden, that passion is dance. 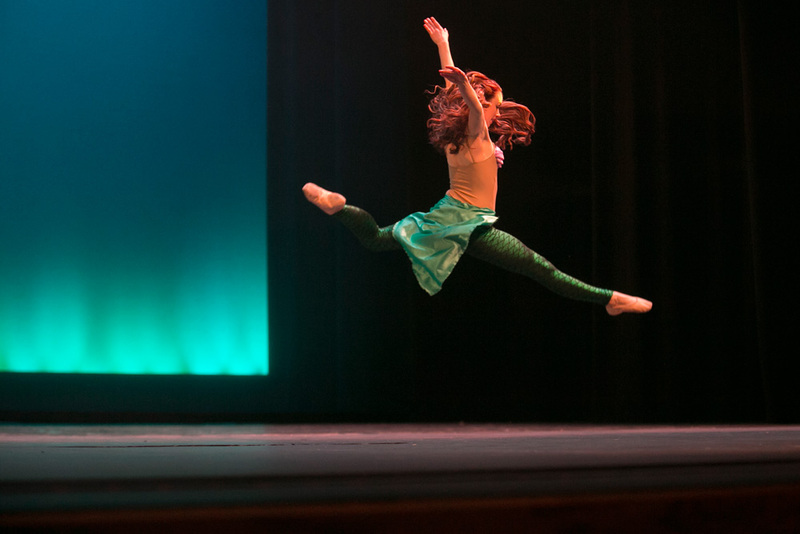 Through dance, Tilden can show off her own uniqueness. Teaching others to dance, she says, helps her draw out their confidence and creativity, too. Tilden taught dance at a Rolla studio for two years before starting her own program at the local health and fitness center. “I am the coordinator and sole instructor for the program, which has around 25 kids and includes seven different classes,” says Tilden, who has coached and choreographed for competition dancers for three years. As a student, Tilden served as president of the Missouri S&T Ballet and Dance Club for two years. There, she directed, choreographed and starred in several full-scale dance productions and led a group of over 40 student dancers and children from the community. “I am in the position to share my love of dance with many people each day – from toddlers to adults,” she says. Tilden was also a member of the Scrubs Pre-Med Society. She completed over 60 hours of observation with physicians and physical therapists and plans to use that experience as a platform to launch her next endeavor. 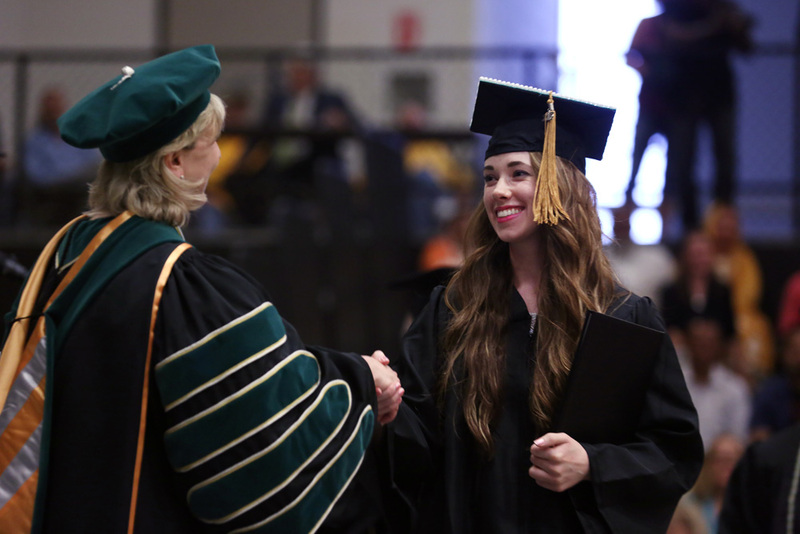 Next year, Tilden plans to enroll in physical therapy school. Her ultimate goal? Becoming a dancer-specialized physical therapist. Tilden believes that through dance, she will be able to help others better express themselves while they improve their physical and mental health. Feeding a college student is hard work. Feeding thousands of them every day is even harder. With various allergies, dietary restrictions and personal preferences, college students are arguably among the pickiest of eaters, says Michael Wuest. Wuest, who holds a bachelor’s degree in business and an MBA from Missouri S&T, is responsible for pleasing the palates of thousands of college students every day. 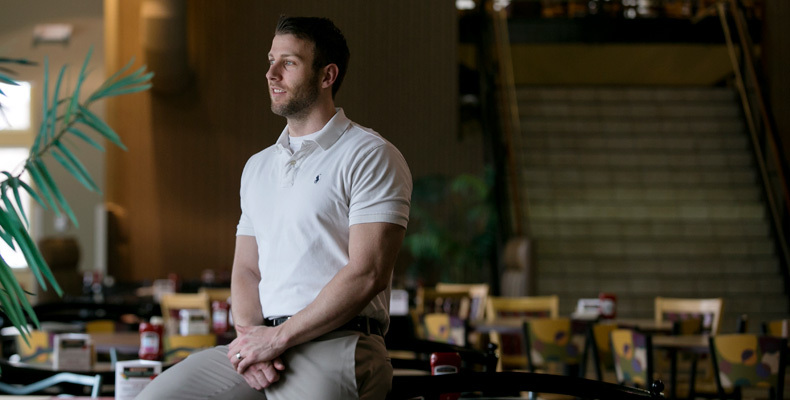 As the marketing manager of the University of Missouri-Columbia Campus Dining Services, he knows how hard it is to find and implement dining options that students will like. Wuest and his team serve over 4 million meals a year. They accommodate all the needs and preferences of each student through options — lots of them. When choosing new dining options and locales, Wuest takes everything from student feedback and historical data to traffic flow patterns and upcoming construction into account — all while staying innovative and on top of current trends. “The biggest component of our success is open communication with our primary customers — the students — and providing the options they want when we know it’s a good fit,” he says. With so many choices, it is hard to ensure quality and consistency and eliminate waste. Wuest says batch cooking solves all three problems. Wuest says that cooking in batches does not involve taking frozen food from a box and putting it in the oven. In addition to prioritizing quality, cutting waste and implementing from-scratch cooking, Wuest stays on top of major trends in campus dining systems. Wuest and his team are sure they will please the palates of nearly every student. By her own account, 2012 was the toughest year of Kamaria Blaney’s life. She had a baby, lost her father and broke up with her boyfriend. Along the way, she ballooned to 238 pounds. That is, until she took a long, hard look in the mirror – literally. “I remember the exact moment: It was Christmas time three years ago,” she says. “I was sitting in one of my favorite stores – Charlotte Russe. My boyfriend had gotten me a jacket and he said, ‘I hope it fits you.’ Because it was the biggest size they had. Blaney signed up for CoolRunning’s Couch-to-5K Running Plan, in which beginners can ease into a running regimen by running 30 minutes a day, three days a week, for nine weeks. She stopped eating fast food and junk food, she says, and started praying. Blaney says her faith helped motivate her to improve her health. 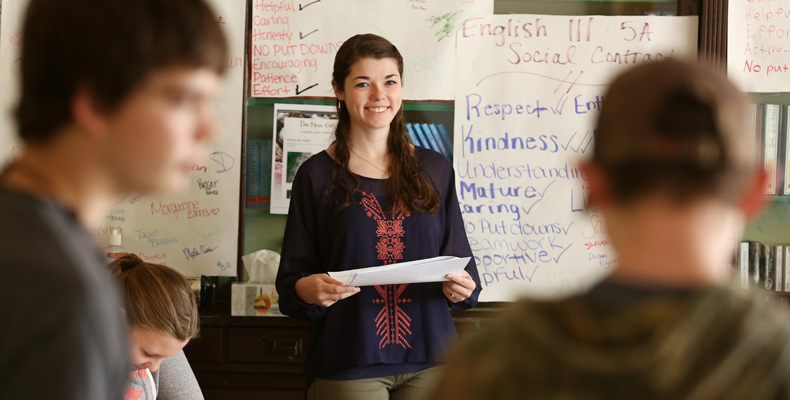 Tragedy struck Blaney’s life again in March 2013, when a friend and classmate took her own life. Despite her grief, Blaney didn’t turn to food. That loss inspired Blaney to start a motivational Instagram group called “Fit Friends Last Longer.” Here she and her friends share photos and stories of weight loss, exercise and diet. She says Internet supporters have been her biggest motivators. “People Snapchat me; they Instagram me; send me all types of nice messages,” she says. “They watch everything that I’m posting. Since March 2013, Blaney has lost over 80 pounds. 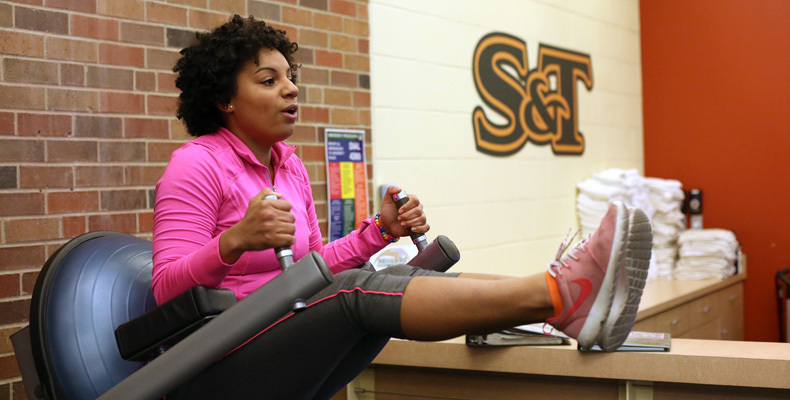 One day Blaney hopes to get personal training certification and open a fitness center, but for now she’s focused on completing her engineering management degree. “I love the idea of collaboration, figuring out how things work,” she says. “I feel like I can apply that to anything. Blaney, who was nominated for an Inspirational Woman Award in 2014 by the Women’s History Month Planning Committee, hasn’t forgotten where she was three short years ago.